The Toyota Camry has been in production since 1982, and was originally classified as a compact car. Currently, the mid-size Camry has been one of Toyota's best-selling nameplates, and more good reason. The Toyota Camry has been available to the American marketplace in various body styles, such as a sedan, and a wagon. Today, the Camry is available as a midsize sedan with four doors. The 2015 Toyota Camry came to the market with a refreshed look, new features, and an overall updated appearance. While the sedan did not receive a complete makeover, the Camry’s 2015 debut still made a significant impact on the automotive world. 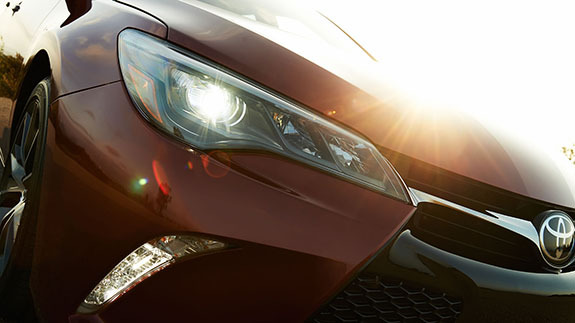 With brand new advanced in-vehicle technology, the Camry is as smart as it is practical. Driver’s who are looking to save even more money at the pump, can opt for the 2015 Camry Hybrid, available in LE, SE, and XLE trim levels. Wireless Charging - With this available technology, drivers can leave the cluttered charging cords back at home. 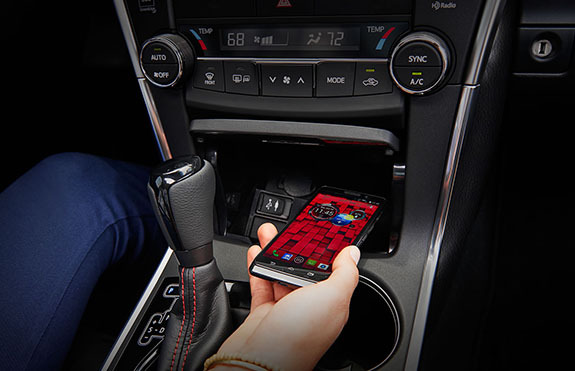 This wireless charging system is incorporated into the cabin of the Camry, and allows passengers to place their Qi-compatible device on the nonslip surface, for completely wire-free charging. Entune App Suite - This available technology allows drivers and passengers of the 2015 Camry to access Pandora, and iHeartRadio for music, buy movie tickets with MovieTickets.com, and make restaurant reservations with OpenTable. The unique system also allows for traffic updates, local fuel prices, and traffic and weather. Navigation System with Traffic - Powered by HD Radio, the Camry has an available traffic-monitoring system that provides real-time information on local traffic flow, and provides alternate routes upon request. Trip Information - Drivers will always be “in the know” when it comes to their driving habits. Camry’s advanced trip information screen shows cruising range, elapsed time, fuel economy history, average speed, and much more. Voice-Activated Features - Optional voice recognition allows easy access to the Bluetooth hands-free phone, navigation system, and Entune App Suite. Best of all, this advanced system picks up on normal voice projections, eliminating the need to sound like a robot. Multi-Information Display - Camry's available multi-information display is a completely customizable way for drivers to see incoming call information, turn-by-turn navigation directions, fuel economy, and dynamic radar control. This full-color display was designed to be easily seen from any angle in the Camry’s cabin. The 2015 Toyota Camry did not simply receive an update, nor did it undergo an extensive redesign. Instead, the Japanese automaker met in the middle with an extensive refresh for 2015, bringing the Camry further into the future, all while sticking to its roots. Expressive Exterior Styling: The 2015 Camry was constructed with all new sheet metal that replaced all body panels with the exception of the roof. The Camry received a new grille for 2015, with a flare-out design that is all black i appearance. SE and XSE models have a new honeycomb grille appearance, making it stand out even more. New headlights and tail lights with standard halogen, and standard LED daytime running lights. 16-inch steel wheels come standard on the base LE models, while 17-inch and 18-inch alloy wheels are standard on the higher trim levels. Interior Updates: The 2015 Camry features a restyled center console with updated technology, and higher quality cabin materials. The overall feel of the Camry’s interior cabin is more refined with these much-appreciated updates. The 2015 Camry Hybrid is as sleek as it is efficient. With Hybrid Synergy Drive, drivers can expect an impressive 200 horsepower performance. The lightweight materials, and aerodynamic design, work together to bring the highest EPA-estimated fuel economy ratings that the Camry Hybrid has ever seen. Fuel Economy: The 2015 Camry Hybrid uses various smart technologies to make the driving experience fun, and more efficient than ever before. The Camry Hybrid LE offers an impressive 43 miles per gallon in the city, while the sportier Camry Hybrid SE offers an EPA-estimated 40 miles per gallon in the city. Standard Energy Monitor: All Toyota Camry Hybrid models feature an informative Energy Monitor display, that shows drivers all of the tools they need to achieve a more efficient ride. The display includes the gas engine, the electric motor generator, and hybrid battery. Real-time information is displayed as conditions change, alerting the driver on how the power is being routed, and how the battery is being charged. More Cargo Space: Drivers of the 2015 Camry Hybrid will be pleasantly surprised by the amount of trunk space available. In typical hybrid vehicles, the large battery pack takes up the majority of cargo space, but that isn’t true with the Camry Hybrid. The battery pack sits behind the back seats, ahead of the trunk space. That means, the 2015 Toyota Camry Hybrid offers its drivers more cargo space than its competitors, all without sacrificing fuel economy. Low Rolling-Resistance Tires: Advanced tire technology with increased inflation pressure is employed on the 2015 Toyota Camry Hybrid, to ensure reduced rolling resistance for improved fuel economy. The result is a smoother ride, and fewer stops at the pump. Drivers can drive away in a 2015 Toyota Camry Hybrid for only $26,790 as a starting MSRP. Drivers can choose from the base Hybrid LE, the middle of the road Hybrid SE, or the ultimate in luxury with the Camry Hybrid XLE. The Hybrid XLE comes standard with luxury features such as leather-trimmed multi-stage heated front seats, standard Entune Audio Plus system, a 6.1-inch touch-screen display, and a standard rear back-up camera. Drivers can expect the most from the Camry Hybrid XLE, without breaking the bank.